PROTECT OUR DOLPHIN NEIGHBORS (POD) of Santa Barbara is a new, much-needed, and all-volunteer project committed to protecting our dolphin neighbors along the Santa Barbara and adjacent California coastline. POD was founded by Toni Frohoff, Ph.D., renowned wildlife author, science-based advocate, and marine mammal behavioral biologist. 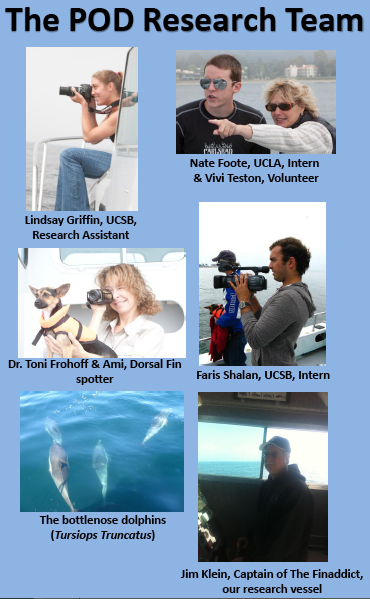 With the help of POD’s students, volunteers and extended community, Dr. Frohoff is focusing over 25 years of international expertise on a critically challenged and dangerously small population of coastal bottlenose dolphins off the Santa Barbara and extended California coastline. Created in 2009, POD has already contributed innovative research that is directly vital to the protection of these dolphins – while simultaneously mentoring and teaching students, locally and from abroad, and educating the community! The coastal bottlenose dolphins in Santa Barbara and surrounding waters need our help now. These dolphins are now facing a myriad of unprecedented environmental challenges, many of which we share with them in our coastal community. With their very small population (perhaps as few as 350 individuals along the entire California coast), dwindling pod size (a sign of stress and challenges to survival), lesions on their skin related to contaminants, severely high contaminant levels in their bodies, and exceptionally high risk from to additional coastal environmental threats, these animals both deserve and need our support. for the benefit of generations and human children to come! POD is a priority project of the long-standing & respected, all-volunteer “umbrella” 501(c)3 organization, TerraMar Research. Our work has been featured in Science, Time Magazine, the cover of the New York Times Magazine; National Geographic, Animal Planet, Discovery Channel, and BBC Television and documentaries, and numerous other national and international publications. We are engaged in pioneering research, education, and community and government-related projects to address the increasing challenges facing dolphins and all the other animals with whom we share this beautiful planet. For beautiful dolphin POD pendants created by the inimitable and iconic Santa Barbara sculptor, Bud Bottoms, please visit the animal-friendly, fabulous, and non-profit Santa Barbara Arts in La Arcada Plaza or call them 805-884-1938 … we are grateful for their generosity! We appreciate your patience in our responding to volunteer and other communications … we are current creating an even stronger infrastructure to support students and the community!